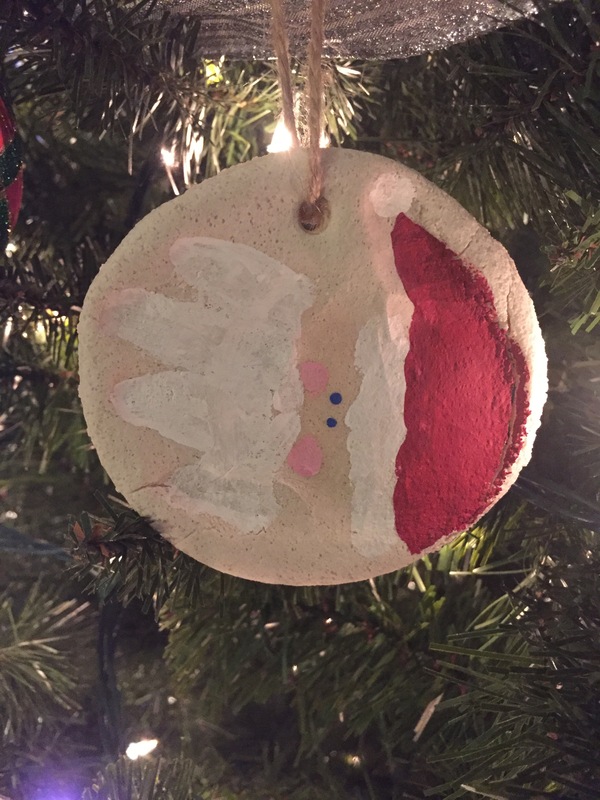 A couple of years ago I posted about making last minute Santa hand print salt dough ornaments (pictured below). We had so much success that we wanted to use the recipe again to make ornaments again this year. It doesn’t hurt that its super affordable, I already had everything to make these in my house and it’s a total breeze. I promise this is one Pinterest project that you can’t mess up! O is older so I opted to let her help with everything. As mentioned in the previous salt dough post, I discovered using my stand mixer and dough hook were most effective. This worked well because I literally just let O dump the ingredients together and I flipped on the mixer. Once mixed well I kneaded it a bit more by hand… I’ve noticed a little body heat and elbow grease make the dough smoother. Then I helped O roll it out in 3 batched on parchment paper (wax paper would work too) and let her do her magic with a handful of holiday cookie cutters. I used a straw to make holes so that I could hang them by twine later. I baked as many as I could fit on a cookie sheet at a time at 200F for about 45 minutes and flipped them over for another half hour on the back side. I just kept watching and peeking in on them. The next day we were ready to paint! 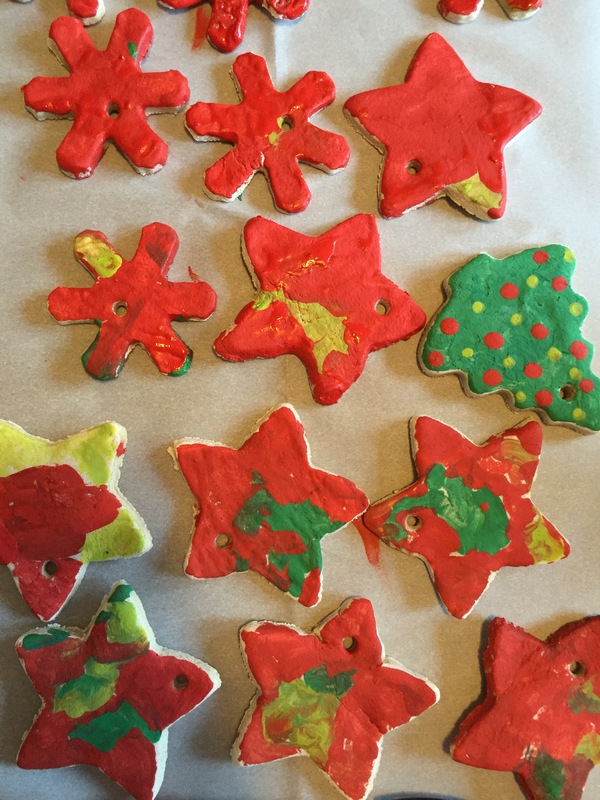 I used an egg carton to hold small amounts of acrylic craft paint that she chose to decorate her ornaments. She had a field day and painted most of them in one sitting! 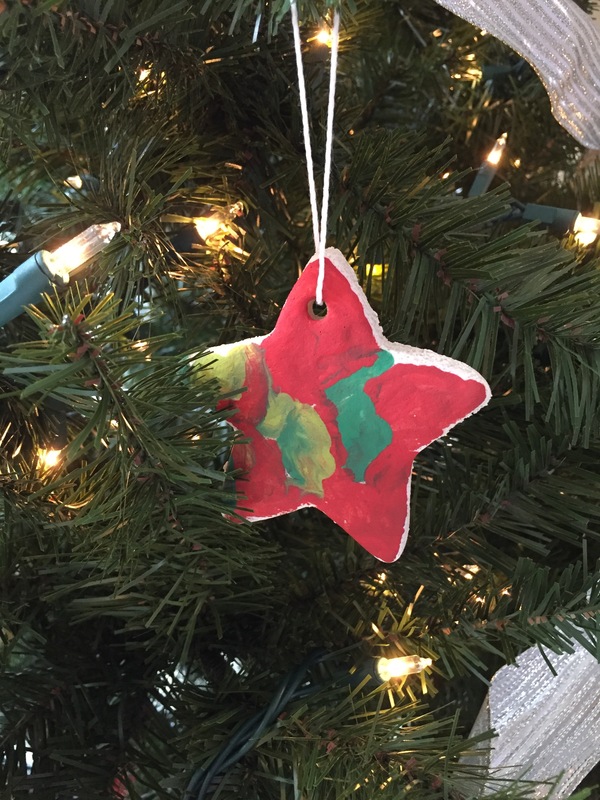 The paint dries fairly quickly so I followed up behind her writing her name and the year on the back of each ornament and then tying a string through the hole I’d made earlier. Ta-da! These are gifts for family members, special friends and neighbors. So if you’re reading this and later receive one as a gift just act surprised (wink wink).